The NorVA Theater is located at 317 Montecello Avenue, right across the street from McArthur Mall and a few blocks from Waterside. Past performers have included James Brown, Matchbox 20, Little Feat, Ringo Starr, Stone Temple Pilots, Brian McKnight, and Tracy Chapman. NorVa concert schedule. The adjacent Backstage Cafe features rock and roll memorabilia. See hotels closest to the NorVa at TheConcertNexus.com. The Attucks Theatre at 1010 Church Street, began it’s life in 1919 as a theater for the African-American community. Today, it is a state and national historic landmark and the oldest remaining legitimate theater in the nation that was completely finances, designed, constructed and operated by African-Americans. During the summer at Ocean View Beach Park you can enjoy Big Bands on the Bay every Sunday night. Big Bands on the Bay schedule. Norfolk Scope and Chrysler Hall are the home of Norfolk’s major sporting and concert events. Scope’s domed roof and distinctive support structure is a well known downtown Norfolk landmark. Scope is the home of the Norfolk Admirals Hockey team and the Norfolk Nighthawks arena football team. Scope is also the venue for many concerts and events throughout the year. Scope schedule of events. Chrysler Hall, located adjacent to Scope, is Norfolk’s fine arts venue. 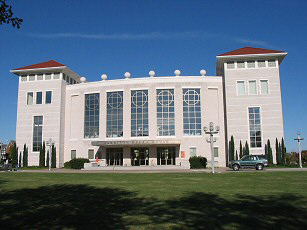 Chrysler Hall is the home of the Virginia Symphony, and hosts traveling Broadway shows and other concert events. Chrysler Hall calendar of events. The Harrison Opera House, located in the Ghent area of Norfolk, is the home productions of the Virginia Opera and other live performances. The historic Ghent area also offers a variety of restaurants and shops, and venerable Naro movie theater, which shows a selection consisting primarily of independent and documentary films. The AAA Norfolk Tides baseball team plays in downtown Norfolk at Harbor Park. You can see ships coming and going beyond the outfield wall at this excellent ballpark. The Norfolk Tides are the AAA affiliate of the Baltimore Orioles. The Norfolk Admirals are the American Hockey League (AHL) affiliate for the National Hockey League’s (NHL) Chicago Blackhawks. The Admirals play a 40 home game schedule from October to April.